Is Artificial Intelligence really needed to improve your CX? Why chatbots may not be good for you. 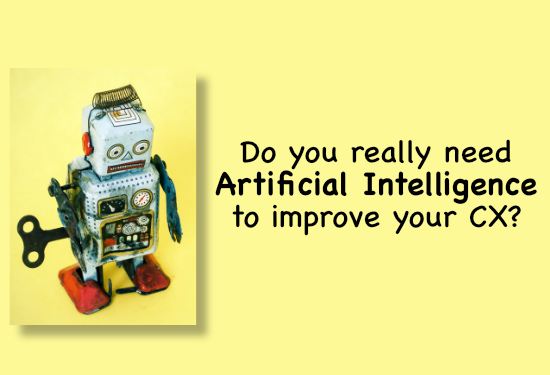 HomeExecutivesIs Artificial Intelligence really needed to improve your CX? probably because of the wait times to get through or ending up off shore!!!! So I started to look at some of the numbers. So look again at the percentage applying AI and those not even considering and it would not take a genius to work out its the big centres, the ones with fully integrated platforms, IT departments and high traffic volume that are occupying the adopters of AI. Yet every other article is saying this is the future. The same thing is happening in the outsourcing space. The need to slim costs to be competitive means having the latest technology (including AI). Only the big organisations can afford the investment and we have recently seen the medium sized organisations fall by the wayside. This leaves a gap in the market for customers with small contracts and the only providers that will consider small contracts are off shore. often the old fashioned way! Yes, they TALK to people. I am seeing predictions of job losses as AI takes away the need to talk to people. However I saw this 20 years ago when email conversations started to rise. Cries of The death of the call centre were made yet the number of calls did not drop, just the number of emails increased! Then social media kicked off  again the number of calls would drop away, until I saw a statistic that 8% of all media enquiries ended up with a phone call (that stat from a technical provider!). I recently had a problem with an online company and the only method of contact was email. I waited a week for a response and got a reply that not only did not answer my question but was written in poor English (the phrasing used indicated it was generated somewhere in Asia). I responded and asked for a reply to my original question and a few days later I received a further response which partly answered it, and gave me a credit (which I had not asked for). I cant be bothered to go back again and wont use that company again. So when do companies realise that the customer experience is not about making it easier for the company (i.e. cutting costs) but for the customer to be happy so they give repeat business. So often companies I work with have lost (or forgotten) the basics. Managers from other parts of the business fail to grasp customer experience or managers have been promoted with minimal experience. So to return to my original point  what is the future for AI? In the right circumstances its excellent. But it is NOT going to revolutionise customer experience. Used well (and for the foreseeable future only by large organisations) it will aid filtering of enquiries and self-service. The importance will be to direct those that need assistance to a contact point, AND for that contact point to react quickly and efficiently to resolve that question i.e. a real person. For smaller organisations without the resources they need to look carefully at AI and its ROI. Bearing in mind many do not have multimedia yet and if they do it is probably not integrated. I would also encourage companies to review the basics BEFORE they go headlong into AI. Basically put, if the foundations are not in place it doesnt matter what great add-ons you add, a lemon is still a lemon. And no I dont see the death of contact centres any time soon. People still like to talk to people. I do see the death of companies that forget that! As you will see James the comment was made about the quote not the article ….. Looking forward to your subsequent articles – as a recruiter you will be well aware of the recruitment and staff engagement impacts on organisational costs and ROI. As the author of the article you are referring to, I refute the claim that the article is in any way a sales pitch for AI products. The contriubtors to the article were sought out by me personally as I wanted comment from those at the coalface. This is the first in a series of articles we will be publishing discussing the findings of our survey. Other topics including emotional intelligence, the current view on work-from-home for contact centres and changing views on other topics.